This guest post was written by Sam Ozer, a writer who runs the quirky family travel blog, Growing Up Two. Sam is a British mum living in Oludeniz, Turkey with her husband and young twin boys. Take a look at her blog for a humorous take on family travel, Turkish recipes, and rambles on raising kids in a country where you learn to expect the unexpected. You can also find Sam on Facebook, Instagram and Twitter @growinguptwo. The school holidays are fast approaching. Many of us are now starting to gather bits and pieces to pack for our sun-drenched breaks away. But travelling abroad with kids can throw a curve ball if you‘re not prepared. You have to contend with the journey, avoiding tantrums, overly tired or excitable kids, getting to thedestination and realising you’ve forgotten something important. It’s impossible to plan for everything, but to make life easier, here’s a few tips to help take the stress out of travelling abroad with kids this summer. – Involve the kids in choices, get them excited about their holiday. Kids like to feel important and be involved. Whatever their age, theylove looking at pictures and watching videos. No matter if you are atthe holiday planning stage or already have your destination organised, let the little ones see pictures of where they are going, the plane that will take them there, the beach, hotel and airport. If kids, especially the under 5’s, have an idea on what to expect and what is expected from them, they are far more likely to behave and enjoy the journey. – Book accommodation suited to you budget and family. There are lots of accommodation options available and prices range dramatically. Think over and discuss which type of board best suits you and your budget. All-inclusive hotels are initially expensive but do mean that you have paid for the majority of your holiday before arrival. Food, drink and entertainment are all included. This can be great if your kids constantly demand snacks, drinks and activities. Larger resorts and hotels also have kids clubs allowing you free time (do check the deals carefully for hidden charges). Bed and breakfast or half board is cheaper initially and allows you the freedom to head off and explore. Self-catering is perhaps the most budget friendly, especially for larger families, but do keep in mind that many residential complexes are a little out of town. Check where your accommodation is and keep in mind that it may be worth the added expense to stay a little closer to the resort or beach as taxi and transport charges can be a hassle and mount up quickly. – Join social media groups in your destination and ask what you need to take with you. Heading to Spain, Italy or Turkey? Most European countries and popular destinations are well kitted out for kids and the menus at local restaurants brim with familiar, kid-friendly options. But, do keep in mind that what’s on offer in local resorts may vary considerably from what you’re used to at home. Take Turkey for example. The locals are extremely child friendly and there’s more than enough chips, burgers and pizzas to please the average youngster (along with loads of healthy options!). But, if you’re travelling with a baby or a little one weaning, there are very few fancy puree pouches or packs of first nibbles, these are something you may want to take with you to make life easier. High factor kids sunscreen is also expensive in many foreign destinations. Take a look online or pose a question to a local Facebook group to figure out what to pack in advance. – Pack smart. Don’t take unnecessary things. Once you’ve figured out what you need to get from the locals, don’t go over the top cramming everything (including the kitchen sink) in your suitcase. Find out if the hotel has a hairdryer and towels. Clothes, especially beachwear, are normally cheap in resorts and the likes of shampoo and basic toiletries are available the world over. Take a few of your kids favourite toys, double up on that snuggly ‘she can’t live without it’ bunny, but remember toys can also be bought locally and kids love the excitement of new things. Instead of buying travel toys before you go, save the money and buy them once you arrive. New toys they choose themselves will keep them entertained longer giving you a well earned bit of peace and quiet to enjoy a drink as they play. Roll your clothes and pack underwear into shoes to save space, and let the kids choose which clothes they want to take to avoid arguments. – Check online reviews before booking excursions. If you’re the type of family that likes to get out and explore, do check out excursions online. Most destinations offer a heap of family friendly boat trips, jeep safaris, visits to sites of interest, beaches or historical ruins. Keep in mind that the cheapest option is not always the best. Often budget deals mean drinks on the boat may be expensive, or you may have to stop off for an hour at a gold shop or souvenir market where trip organisers get commissions on purchases. A look on Trip Advisor or review sites normally gives a good idea on what excursions are best value for money and most suited to families. – Just go on holiday and enjoy! Head off with the right expectations. Don’t head off on a holiday with young kids expecting the perfect trip – manage your expectations. Travelling with young kids normally means you have to slow things down. The sun and excitement does mean youngsters get tired quickly and may not last as long wandering around exploring before they start to get cranky. Kids love new experiences, but slow it down and be prepared to spend a little longer in the shade entertaining yourself as they take a nap. Giving kids the opportunity to make new holiday friends, try different food and see new things is undoubtedly educational and a good thing, but remember to just go with the flow as no-matter how much you prepare in advance, things are unlikely to go completely to plan. Great tips! I didnt take my eldest abroad until he was 7 because I was so nervous about taking him beforehand! 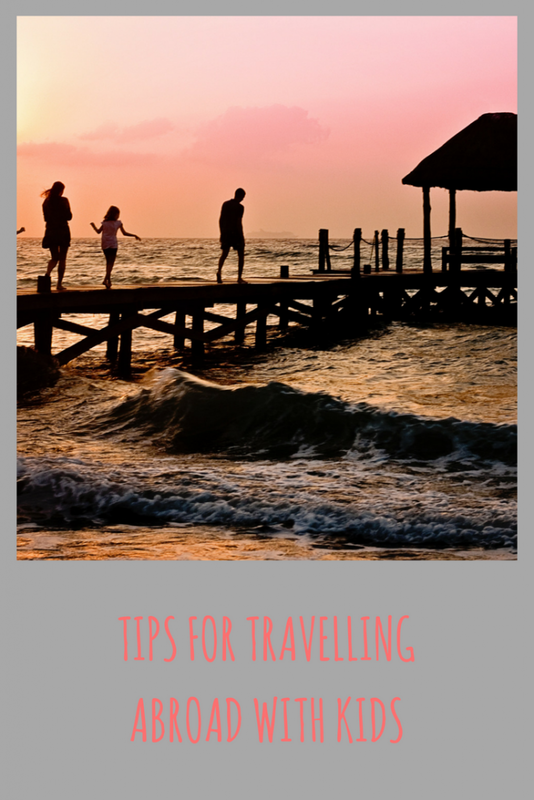 We don’t travel abroad as much as we would like to with our two kids, these are fab tips which I will take not off when we do. I recently wrote a post on Travelling with Kids so its nice to see someone else sharing their tips too!